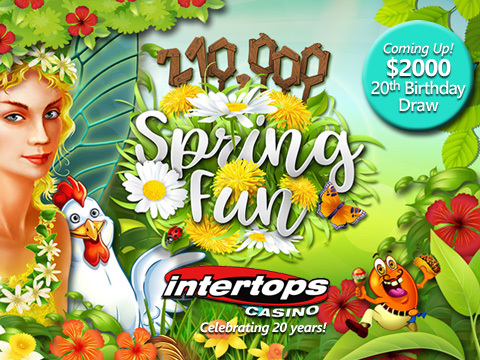 Intertops Casino players will be competing against each other for nearly a quarter million dollars in bonus prizes this spring as the world’s most trusted online casino celebrates its 20th birthday. During the $210,000 Spring Fun casino bonus contest, which continues until April 23rd, players will earn points when they play online casino games. Players with the most points will win weekly prizes up to $500 each. Players earn frequent player points on their desktop or laptop computers or in the mobile casino on their smartphones or tablets. Even occasional players can win prizes in random draws every week. There will be a $1000 cash draw at the end of the Spring Fun event. Top players each week are eligible for that prize. In addition to the Spring Fun draw, the casino will also do a $2000 20th Birthday draw the first week of April. For every $50 bet in the casino between now and March 31st, players will get one ticket in the random draw. Spring Fun contest details and current scoreboard rankings are available at http://casinopromotions.intertops.eu/springfun. Celebrating 20 years of bringing fun and excitement to online casino players around the globe, Intertops Casino offers hundreds of games from Realtime Gaming. Founded in London in 1983, Intertops accepted the world’s first online sports bet in 1996. It launched its first online casino in 1998 and its poker room in 2003. There are more than 300 casino games from Real Time Gaming (RTG) in its main casino and another 200 games from Wager Gaming Technology in the Intertops Casino Classic. Several slots have progressive jackpots currently well over $1,000,000. Intertops’ most popular games are available in its new enhanced instant play online casino and new mobile casino. Intertops players compete against each other for top weekly bonuses.